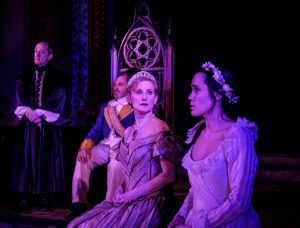 Director Sean Hagerty has crafted a sensational gift for you – a production of William Shakespeare’s “Hamlet” that transports you to a sensorium of theatrical perfection. Part of the success of this work is that it takes place in the Grace Church in Jersey City (one stop on the Path train from Manhattan). The church setting creates a sense of grandeur, ritual and opulence. The sins of the characters seem more overt with God ever present in the stained glass windows and gothic arches. We become the congregation, the priest in the confessional, the court – we are complicit and voyeuristic as the tale is woven around us – the performers in touching distance from our seats. In this circular, saintly space there is no escape from the crimes of murder, infidelity and cruelty. The performers communicate across the vast expanse of the church with their voices ricocheting off the high ceiling beams. We are in the “pews”, we are in the confessional, we are privy to the shame, the undercurrents, the lies…it all feels more shocking when it is taking place in the house of God -like he is listening in. We feel culpable and deeply aware of our own indiscretions and our raw human fragility. It’s completely absorbing. The brilliant cast fill this iconic backdrop with strong performances, their presence igniting every corner of the hallowed hall. No weak links. Everyone had wrestled with the iambic and came out on top. Sean Hagerty’s prowess with Shakespeare is evident in every moment he has created – we are not alienated by the language but rather engaged by it as the text comes to life with crystal clear meaning, emotion and intention. It’s like Hagerty got hold of the “Babel Fish” from Douglas Adam’s , Hitchhiker’s Guide to the Galaxy and inserted this instant translator into our ears so no meaning was missed. Hamlet is one of the greatest plays on earth and in the capable hands of Shakespeare@ you’ll definitely want to keep the playbill as a keepsake from this unforgettable version. Every time there is a blackout, you get gooseflesh as the moonlight streams in through the stained glass windows. The way the “Ghost” appears at various moments is terrifying. A glorious adrenaline rush. David Hargreaves, veteran of the English stage and screen, gives a powerful “voice” to the ghost of Hamlet’s father. It is an aural delight. 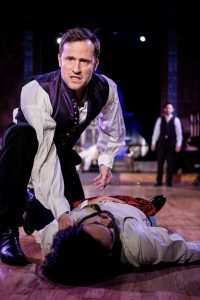 Jonathan Forbes as Hamlet wears the role like a Saville Row bespoke suit. It fits him to perfection. He gives us a analytical academic with obsessive thoughts and musings, a brazen lover, an emboldened son, a demanding friend, a sinister revenge seeker, an unhinged fighter and a hurt boy. His mighty presence invigorates the space but it is not all sound and fury but rather a highly nuanced rendering of a man devolving from the infection of too many lies. This is a performance you do not want to miss. Sarah Johnston’s lighting design is so full of creepy shadows and dramatic surprises you feel like you’ve entered the horror house at a fairground. You want to take the ride all over again. She paints light into the forgotten crevices of the Grace church with the eye of an old master transforming a canvas into a divine spectacle. Hidden spaces keep getting revealed through the play. It is so satisfying to see another area of the church come to life. 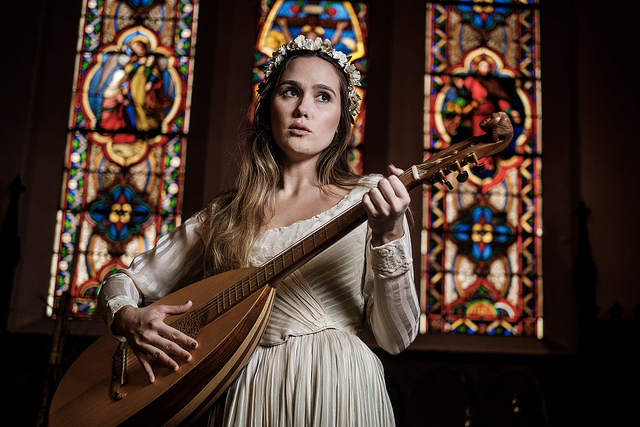 Eden Brolin as Ophelia is magnetic. She gives us a translucent women full of complexity, engulfed by raw emotion. Her unravelling was so devastating and incredibly moving -she had me in tears. Brolin is a massive talent. Along with her seismic ability to manipulate emotions she is also a beautiful singer with a powerful voice that soared on the acoustics of the room. The costumes looked like they truly belonged in the space and in the period. Anne-Marie Wright ensured a lush color palette that spoke to the core elements of each character’s personality. Fight director Brad Lemons lets you be part of the fiery action as rapiers swing past at mere inches from your face (or so it seems) stimulating instant panic attacks. I loved every second of it. The moment when Laertes hears of the death of his sister was heartbreaking. I could not look away from Aria Shaghasemi’s tortured sadness. He gives a monumental performance in the role – going to great emotional depths and filling the space with a robust physicality and ability to draw you into his soul agony. Dongyuk Chang conjured a sound design that envelops you. The sound seems to come from the floorboards, the ceiling, behind you, in your head – he wraps you in underscore and plays your emotions like a fiddle. Joan Melton’s music and musical direction takes you on an epic emotional journey of insane highs and lows – tearing at your heartstrings ruthlessly. The arrival of the acting troupe and their heightened, stylistic performances was one of my most favorite moments of the play. Mark J. Quiles and Alice Marks played “ham” so convincingly I wanted to give them a standing ovation. Their subtle commentary on what they thought of the royal patrons was devilishly rendered. These two actors keep appearing in different roles from grave diggers to courtiers and their character transformations are thrilling to watch. You have villains you just love to hate. Thia Stephan as Gertrude and Mark Torres as Claudius are the source of Hamlets violent unmooring. Torres gives us a weasel and Stephan is the wanton wife. They are icy and quite self-absorbed. Both actors bring a wealth of experience to their roles, anchoring the production with the weight of their expertise. Fernando Hernández and André Revels as Rosenkrantz and Guildenstern are delicious as the two friends who look like the cats who have stolen the cream. They glow with inner joy, like they have secrets they wish they could tell you. There is a boisterous camaraderie between them as they try to fathom why their friend is so glum. They are as yet untouched by melancholy, unrequited love or familial disappointments so they exude a sense of youthful optimism. When they entered the stage they vibrated the ions of the space with moments of playfulness. Tenszin Yeshi, Wesli Spencer, Robert Steven Anderson and Francis Mateo (Horatio) round out the skilled ensemble. They each bring rich, layered and focused performances that energize the whole. They are great examples of how to savor a small role. Sean Hagerty’s direction, Sean Hagerty’s direction, Sean Hagerty’s direction!! Grove street with all of its restaurants, bars, nightlife and of course Words bookstore is just around the corner and gives you a great before or after the play experience. And then of course there is the view of the Manhattan skyline across the water. This production is sleek, immersive, chilling, scary, brave…and more eventful than a season finale of Game of Thrones.